Translated by Anoosha Boralessa (February 2016). Not reviewed by bilaterals.org or any other organization or person. 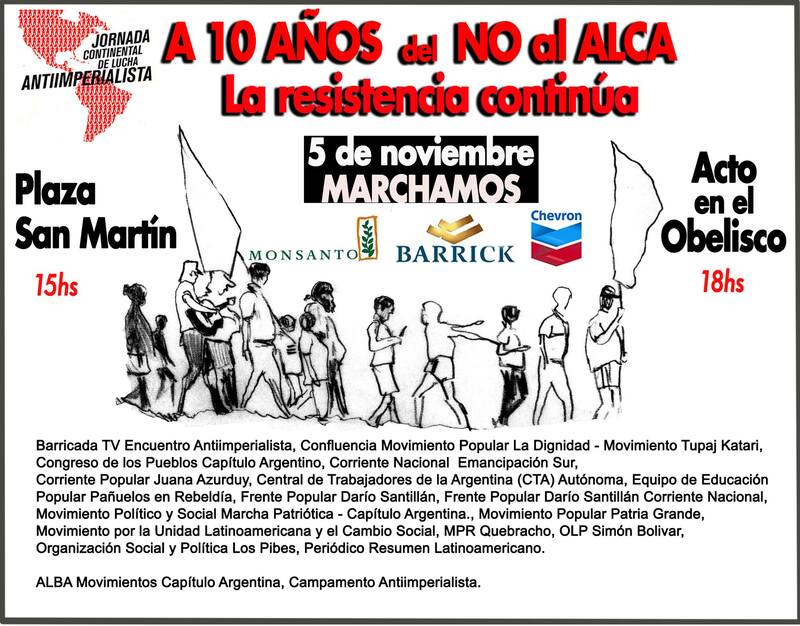 Argentina - A decade after the popular victory that led to burying the FTAAs in the City of Mar del Plata, a number of organizations and popular movements in Argentina assemble as part of a continental day, to go out on the streets to declare that we are continuing to build an alternative that prioritizes integration from the bottom and from the left and not market integration. That month of November 2005, during the Fourth Summit of the Americas, the North American president George Bush arrived in Argentina intending to achieve the signing of the US imperialist proposal: the Free Trade Area for the Americas. However, the reality was otherwise. The people of our America rejected the orders of the empire through popular mobilization, right across the country and the whole continent. “FTAAs, FTAAs, like Hell!”, exclaimed Commander Hugo Chavez Frias and this was a victory over the United States for all the people of America. Today, we see with concern a counter-offensive that tries once again to subordinate our continent. It is not the US acting alone. The progress in the Mercosur – European Union negotiations, China’s penetration and the threat of a new FTAA, interference by transnationals such as Barrick Gold, Chevron and Monsanto in our countries, looting our common goods and leaving behind contamination and poverty for our people, is part of imperialist action ten years on. Today there is a new regional bloc, comprising Chile, Colombia, Peru and Mexico - the “Pacific Alliance”, that seeks to be part of the conservative restoration in the region by presenting economic integration as a panacea. The Right proposes that we follow their example and go forward with free trade treaties. What is certain is that the people in these countries are experiencing the criminalization of their struggle and are victims of terrible consequences of Conservative government policies. In response to this, we reaffirm our defence and appreciation for alternative sovereign projects in the region, such as Alba; we also reject the progress in the EU-Merosur negotiations. Whilst the modernized Right returns with the proposal of subordination and debt in our countries, others propose that we accept the lesser evil. Our response is that we are still resisting and we continue to challenge those proposing integration that only benefits big capital at the people’s expense. We propose another model of political integration and that is the Bolivarian Alternative for the Peoples of Our America (ALBA), initiated in 2004, by the Commander Hugo Chávez and Fidel. It is Latin American integration by the people, from below, originating from popular movements and inspired by anti-colonial, anti-capital, anti-patriarchal and anti- imperialist battles that, for more than 500 years, have been fought in these lands and whose fundamental principle is permanent solidarity and the unlimited defense of our sovereignty in all its manifestations: political, economic, social cultural, territorial, food and energy. A tenet of this alternative model that the people are building, is solidarity rather than competition. It urges harmony with our mother earth and not the looting of our common goods; it encourages a system of peace based on social justice and proposes recovering the humanity of our societies and peoples. In the case of our country, we, the popular movements, watch with worry the discussion facing the forthcoming electoral period on the more or less gradual adjustment. The subordination of Argentina to ICSID, reopening the discussion on paying vulture funds or the proposition for debt and devaluation - these are part of what we the people shall resist once again. We have annihilated FTAAs but in recent years extracting, agro-business, fracking have increased and our region has been converted into the preferred area for mineral exploitation. The looting of our goods and our biodiversity has aggravated criminalization and repression of those who resist and strike blows against the rights of the communities. Faced with this proposal for markets, death, war and individualism that the Empire imposes, we, from the bottom and the left, are building an alternative that we wish to impose. Today, given that free trade treaties are once again on the agenda, given that anti-terrorist laws are approved in our countries with the intention of repressing those that violate their rights, give that the military bases have expanded and right wing groups have got together and organized coup d’etats (for example in Honduras and Paraguay) or the attempted coup in Venezuela, we declare that our best homage 10 years on, is to redouble our commitment and solidarity between the peoples of Our America. 10 years after defeating the FTAAs, we will once again be in the streets to reaffirm the plan for the people, life, peace, and the community, with twenty-first century socialism on the horizon.